It's no April Fool's that I'm a proud Canadian. 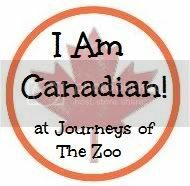 Today, over on Journeys of the Zoo, I discuss how important I believe travel is - to learn about other cultures AND teach others about yours. Thank you to Sarah from Journeys of the Zoo for hosting this great feature! If you are Canadian or have a Canadian Product, Cause, Blog, or other Canadian related item, then you are officially invited to add yourself to the Linky (found at the bottom of the post). Thank you so much for guest posting! Being the nomads that we are, travel is close to our heart. Looking forward to seeing you on the Cabot Trail.